Trump’s words suggested that something terrible had happened the night before in Sweden. Something like the terrorist attacks in Brussels and Paris. Something caused by undocumented refugees. But there had been no terrorist activity in Sweden the night before (Independent). The only recent Swedish terror attack had been over a month ago: Neo-Nazi members of the Nordic Resistance Movement attacked an immigrant asylum in Gothenburg and injured one person. Trump later said that he was referring to a report on an increase in crime in Sweden since the Syrian refugees had been accepted into the country (Independent). Swedish sources, however, however, have denied any significant recent change in crime rates. The world is changing rapidly. It is becoming harder to know what is true and what is false. What do we know of the world? What should we believe? S knows p if S believes p on the basis of evidence supporting p, and if p is true. The truth condition is necessary because we may have false beliefs. This occurs when we conclude on the basis of some evidence that something is true when it is actually false. We may believe that a terror attack occurred in Sweden on January 17, 2017, because the President of the United States said so (or seemed to say so), but this is a false belief. What is ultimately important then is not what we believe but whether what we believe is actually true. Truth is even more difficult to understand than knowledge. Most commonly we consider something as true if it corresponds to something (a “fact”) in or about the real (or “actual”) world. This approach works fairly well for propositions about the physical world, e.g. “Snow is white.” However, it does not work as well for propositions requiring judgment rather than perception, e.g. “Killing is wrong.” In this case, there may be different kinds of truth. The truth of a proposition depends on its context. “Killing is wrong” may be false in the context of self-defense. Yet everything is true or not depending on the context. Even “Snow is white” is false in the context of colored illumination. So we have to come together and decide what we mean by things, and what we consider their appropriate contexts. Philosophy considers this state of affairs in terms of pluralist theories of truth. These ideas become very complex when we consider predictions about what will happen. We have created laws and theories about what will happen on the basis of what has occurred before. These laws and theories are true inasmuch as the predictions they entail have not proved false when we have tested them. Laws about the physical world are more easily considered true or false than laws about human behavior. It is easier to know that the sun will rise tomorrow than that refugees will initiate terror attacks. Most importantly, we usually have to accept the evidence of other people when we decide about what we know. We cannot personally experience everything, nor can we personally test all possible theories about the world. We depend on others to support what we believe. People in Sweden quickly pointed out that there was no terrorist attack in their country on February 18, 2017. In evaluating the evidence of others, we have to consider several factors. Most crucial is whether those providing the evidence are trustworthy, and whether they have previously been correct in their assessment of the world. A second factor is that our beliefs must be coherent. We cannot believe that there was a terrorist attack in Sweden on February 17, 2017, and at the same time believe that no one in Sweden noticed this. Finally, we often agree with what most people believe to be true. It is difficult to insist that something happened when most people say it did not. Conforming to majority opinion is clearly not as good as finding out for ourselves, but in most cases we have neither the time nor the ability to do so. Given our understanding of knowledge and truth, we must realize that the present state of truth is precarious. Trump’s most disturbing habit is also his most ridiculous trait: he credits and is apt to repeat his professed beliefs when – and in exact proportion as – he sees other people credit them. We normally think of beliefs as something you cannot choose (unlike opinions or estimations), but Trump does choose and he correlates the numbers of his followers with truth in the physical world. So when, in an interview on 25 January, the ABC reporter David Muir inquired into his unsubstantiated belief that between three and five million people voted illegally, accounting for Hillary Clinton’s popular majority, Trump replied: ‘You know what’s important? Millions of people agree with me when I say that.’ The when-I-say-that is essential to Trump’s belief and essential to the relationship to his beliefs enjoyed by millions. His belief, triggered by impulsive attraction to something dressed as a fact, is fortified against refutation by the echo of the belief from his followers. In a stunning demonstration of the power and resiliency of our new post-factual political culture, Mr. Trump and his allies in the right media have already turned the term “fake news” against its critics, essentially draining it of any meaning. To tell deliberate lies while genuinely believing in them, to forget any fact that has become inconvenient, and then, when it becomes necessary again, to draw it back from oblivion for just as long as it is needed, to deny the existence of objective reality and all the while to take account of the reality which one denies. Even the description is impossible to pin down. We cannot even define doublethink without getting lost in contradictions. How can we now “know” what is going on? On what do we base our beliefs? Somehow we must find a way of assessing the truthfulness of sources. Fact checkers are essential. Probably the most important is the non-partisan FactCheck.Org. The Washington Post runs a good fact-checking blog. Another source is Snopes.com, which was originally set up to evaluate urban myths but now also deals with fake news. We must support the Free Press – this may be our last bastion of reality. The internet has wreaked havoc with the financing of the press. Most people take their news from the internet for free. This may be dangerous. We must subscribe to proper journalism. 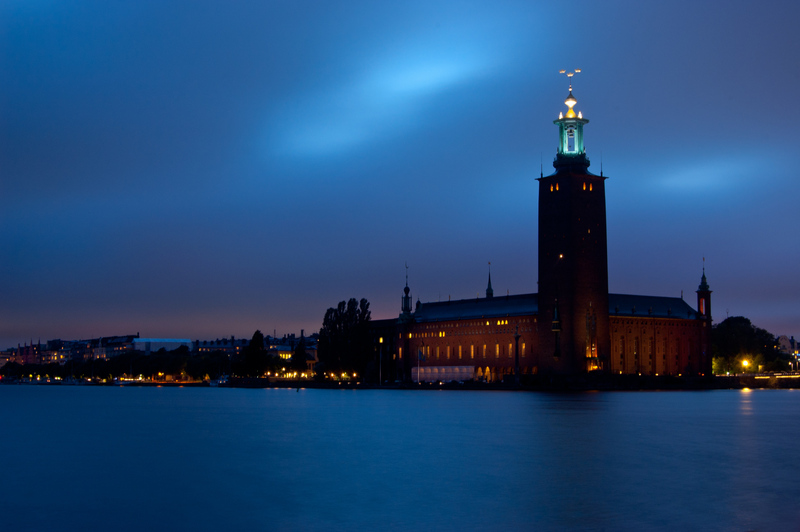 The photograph in the header showing the Stockholm City Hall is from Wikipedia. Terry – Thank you for this thoughtful piece. When it comes to the whole issue south of the border what almost frightens me the most is what I’ve been hearing from some friends and relatives – some here in Canada and some in the U.S. People appear to be increasingly exhausted by the rhetoric, the daily onslaught and drama to the point that they are ‘tuning out’. This seems to have occurred in the latter part of the campaign and certainly is persisting into the new administration. They don’t want to ‘know’, hear it or think about it any longer. Not watching the news, reading the papers and don’t want to talk about it. Even more alarming (from my U.S. relatives) is a ‘well it’s settled – we just have to move forward and get on with/deal with it/accept it’. It’s as if they have suspended their critical faculties out of a feeling of necessity to save their sanity and bring down their anxiety.I feel it invites a descent into the ‘slippery slope’ of what happens when “….good men do nothing” (E. Burke). Fortunately we do still have a ‘press’ who one way or another who I think will remain unwilling to be silenced. How it all plays out is anyone’s guess though. Regards. As someone who grew up in a dictatorship, it is frightening to realize that we seem unable to detect a clear threat to liberal democracy when we see it. It reminds me of those who told the victims of communism “why did you not report all this to the police?”. We are now dealimg with what is to many a foreign and inconceivable danger that is truly unreal to many of us. To paraphrase the German writer, “and then they came for me”. Was initially surprised to see Creature and Creator dealing with current “events” (and non events…). Could it happen here in Canada? One hopes not (didn’t the last election repudiate this?) but we are clearly not immune (e.g., the poll suggesting 25% here in Canada agree with Trump’s Muslim ban; the Quebec mosque shooting, etc). Having lived in Toronto for 4 years with Rob Ford as mayor, I can never become complacent! Populist candidates can certainly be successful here in Canada, and they can wreak havoc with our politics. I think the Brexit promoters in England provided another example of populism run amok. In all these examples, the press and the experts were denigrated. With no sources of reliable evidence, anything can be proposed as truth. In an extremely bizarre turn of events a riot did actually break out on February 20, 2017, in a region of Stockholm with a high concentration of recent immigrants.